← FOLLOW + REPOST winner, Plus all the mixes in one place! It’s about cars, not camping. Tenting is free in all areas, except ShambhaLodging. Because of past issues with the Drop Zone near Metta (people taking advantage and parking in Starlight instead of returning to Free Parking, as well as excessive dust), vehicles will no longer be allowed past the zone that they are decaled for. The baggage shuttle will run from the New Drop Zone (#3) down the main road. The more organized people are with their gear, the more efficient it will be! Baggage shuttle is by donation, proceeds go to the Kootenay Romanian Relief Organization. Enjoy free parking all weekend long! With a Free Parking Decal, you won’t have to pay extra for parking, and you can camp pretty much anywhere you want. Guests who park in Free Parking can use our “New Drop Zone” to drop their gear off closer to the festival before parking their car. No RVs or trailers in the Free Parking Lot. Free Parking is a “No Camping” zone. *Note: If you park in Free Parking, you can still camp with your friends in the Sunshine or Starlight Camping Zones who have purchased parking passes! Receive Free Parking decal from Parking Fairies. Check-in at Field Gate (#14). Go thru Field Gate (#14). Stop at the New Drop Zone (#3) to transfer luggage. *No RVs or campers are allowed to park within Free Parking (#1). The Sunshine Decal allows you to park in the Sunshine Camp Zone. For $20 (regular sized vehicle), you can park next to your camp in Sunshine. RV’s, trailers and any vehicle that can hold over 8 passengers requires a $40 Sunshine Oversize decal to park in Sunshine Camping. Regular ticket holders go towards Field Gate (#14). Follow directions to Sunshine Parking (#4). The Starlight Decal brings you closer to the action, allowing you to camp with your car closer to Downtown Shambhala. For $40 (regular sized vehicle), you can park next to your camp all weekend long in the Starlight Camp Zone. RV’s, trailers and any vehicle that can hold over 8 passengers requires a $80 Starlight Oversize decal to park in Starlight Camping. Follow directions to Starlight Parking (#9). 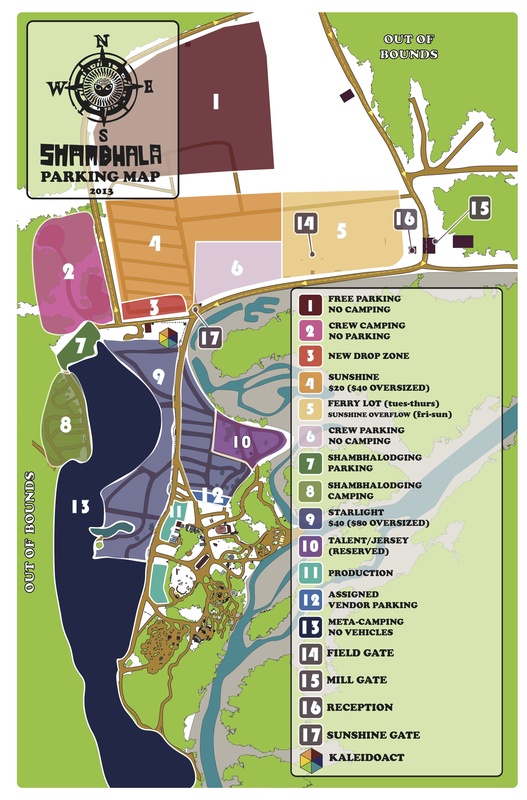 Lodging Parking is reserved for guests in the ShambhaLodging Camp Zone. Canadian Lodging guests will have received their decal in the mail. US & International Lodging guests will receive their decal at Reception to pick up your tickets. Lodging Parking is a “No Camping” Zone. Identify yourself to Parking Crew members as a Lodger. You should have been mailed your Lodging decal in the mail. Identify yourself to Parking Crew members as a Lodger with tickets at Will Call. Check-in at Reception to receive Lodging Decal as well as any Will Call tickets you have purchased. Crew, volunteers, contractors go towards Reception (#16). Park in Reception (#16) parking lot. Can’t live without your phone? See Columbia Wireless for charging your devices. We thank them for bringing us exceptional service. Watch your cigarette butts. There is a fire ban in this area. Cigarettes can cause fires. Please be mindful of the environment & others if you are a smoker. Be prepared for cold nights and hot days. Sunshine Camping (#4) has great flat ground only a 10 min walk from the downtown. With Sunshine Camping (#4), you have the option to park your vehicle at your camp. This camping lot is the family hay field, where the Salmo River Ranch produces a beautiful crop of hay before the festival. It is located right next to Free Parking (#1). Starlight Camping (#9) is closer to the festival’s downtown and less parking decals are available. Starlight Camping is on a first come first serve basis. This area is smaller every year. Eventually no vehicles will be permitted here. Our vision for Metta Camping (#13) is to get rid of all cars in the entire southern section of the farm. Metta Camping (#13) offers flat grass, forest, and river. Free of generators and sound systems. Dust free and safe. The vision for this camp zone includes people walking, bikes, communities without mechanical parts, except pedal power. Enjoy the new terraces. Thank you for reducing your imprint! ShambhaLodging (#8) – the only paid camping, but what a service! Early Entry. Express Lane. ShambhalLodging Parking (#8). Mucho Shade. A campsite set-up and ready for your arrival. It’s all yours with our ShambhaLodging Camping Accommodations packages. Thinking about Lodging for next year? Come visit us and check out the space! All tickets are valid for General Admission on Friday, August 9th at 8am. Guests are welcome to arrive on Wednesday, August 7th or Thursday, August 8th for Early Entry at the rates in the chart below. Why does Shambhala have Early Entry? Once upon a festival, the Shambhala was a a weekend festival, Friday-Sunday – but as the years went on, people kept showing up earlier. In an effort to get people off the dangerous highway & keep them safe (the speed limit is 100km/hr), we allowed our ticket holders to come on site a few days early for an additional rate. Early Entry pricing offsets the costs of additional staffing and service levels for the extra festival days (including the recent extension of Monday through Tuesday morning post-show to allow people a good night’s sleep on Monday). Follow the Parking Staff’s directions through the Ferry Lot (#5). At the Field Gate (#14), you’ll be greeted by a decal fairy who will give you the option of receiving a Free Parking decal -OR- purchasing a Sunshine Parking or Starlight Parking decal (supplies limited). If you are camping in an RV or trailer, you will need to purchase an Oversize Sunshine Parking or Oversize Starlight Parking decal. Oversize vehicles are cannot allowed to park in Free Parking. Prior to 8AM Wednesday, August 7th, crews in the Ferry Lot (#5) will park you until the grounds open. Once the festival grounds are open, parking staff will direct you to the lot that matches your parking decal. Guests parking in Free Parking (#1) may use the New Drop Zone (#3) to unload. If the lineups in the Ferry Lot (#5) are long, Parking Staff will direct you to park in the ferry line and walk back to Reception (#16) to pick up your tickets (so you don’t lose your place in line). Pick up your pre-ordered tickets at Will Call. Proceed thru Field Gate (#14). Follow directions to your parking zone. Parking Crew will direct you to our priority holding lines in the Ferry Lot (#5), if you arrive prior to Field Gate (#5) opening. If arriving after Field Gate (#5), Parking Crew will direct the vehicle to the Express lane. Drive towards Shambhalodging Parking (#7) area. Receive supplementary Shambhalodging Wristband from Shambhalodging manager. Way to reduce your footprint! Check-in at the Pedestrian Lane at Field Gate (#14). When gates open, walk in to set up your camp! In the event that tickets do not sell out in advance of gates opening, they will be available for $340 including tax, at Reception (#16) when you arrive. If the lineups in the Ferry Lot (#5) are long, Parking staff will direct you to park in the Ferry Lot #5 and walk back to Reception (#16) to purchase your tickets (so you don’t lose your place in line).